So, I decided to give myself some help. I created a reflective, conversational activity to stimulate my heart and mind to birth some vision and engender some possibilities about what I would like to see accomplished in and through my life. The premise is this: sometimes I fail to embrace a personal burden or passion because too many things that I think are worthwhile seem unattainable due to a lack of resources…there isn’t enough time, or money, or knowledge, or people, or… in order to accomplish an aim that seems really exciting. As a result, for me, perceiving these limitations in advance, I tend to not even let myself go there and to discover what interests and desires may lie buried beneath the surface of simple maintenance-level engagement in my life and work. In one particular season, shortly after our daughter was born, I found myself especially at a place where I was without time, energy, or inclination to think about the future at all. I was caught firmly in mere survival mode, in the humdrum of doing what was necessary to fulfill my basic home and work responsibilities, but without any hope for anything else, anything new, anything stimulating, or exciting, or rewarding. It’s at that time that I created this activity, as a place where I could pull my head and my heart up out of my current circumstances and to look out beyond, as well as to look down deep, to get in touch with the projects, the aims, the opportunities that would quicken my heartbeat and set my spirit on fire. Spending 30 minutes with my wife taking turns and answering the questions of “What would you do if someone gave you…?” brought us both a few moments of relief and inspiration and togetherness. We enjoyed hearing from one another, and noticed some similarities about our desires for ourselves and our home that got us talking. Even though the question is posed from a place where resources aren’t a factor, we were able to talk through how we could make some progress in certain desires even within our currently available time, energy, and finances. 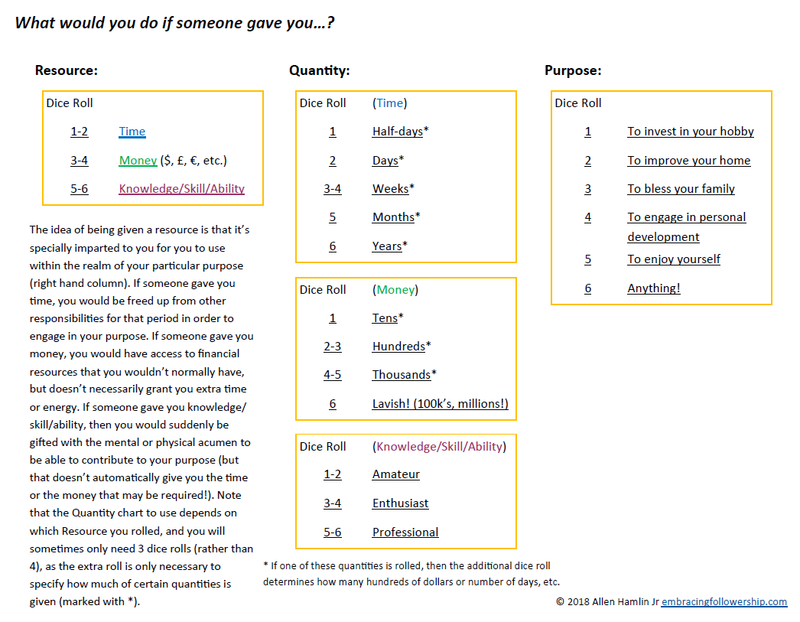 Knowing that I was so depleted that I wouldn’t even be able to phrase the question without some help, I created a quick chart of some various resources, quantities, and purposes–because I knew that if the questions were too open they would be too overwhelming for me to answer! Coupled with a few standard dice, I was finally ready to explore what makes me tick! While there is life-giving delight in realizing, and sharing, these ideas, something else even more remarkable has happened: since voicing them, I’m actually taking some steps toward fulfilling these desires. I signed up for a 1-day photography workshop. Our toilet is now fixed. And I researched an online enneagram course. Maybe those things aren’t on the same scale of what was posed to me in the questions, but they’re at least steps in the right direction, steps toward engaging the deep places of who I am, the things that concern me, interest me, the areas where I desire greater engagement and ownership. If we are to be excellent followers–let alone healthy human beings–awareness of, and acting upon, these burdens and passions is one of our greatest personal resources. When we have a sense of vision, calling, objective, purpose, and ownership which we can clarify for ourselves and articulate to others, we then have some directions in which we can make some concrete steps. And those steps will be all the more effective and fruitful because they are places that we actually desire to go! How’s your sense of vision and possibility these days? This is a question not just for you as an individual but for whatever groups you may be a part of as well: your workplace, your community association, your family, your church. Explore together how you might be able to make some real progress in fulfilling some deep desires which excite your very best contributions and bring you together alongside of others who have similar vision and passions! Download the chart and instructions for this activity, along with other free resources, from the Companion Resources page of this website. Previous postTwo Years of Followership!